Portland, Oregon firms Reworks Inc. and LEVER Architecture are constructing the latest mass timber building. Albina Yard, a 16,000 square foot creative office building, is currently under construction in North Portland’s Mississippi District. The building holds the title of the first use of domestically produced CLT panels for a building-wide structural system in the United States. The building has been under construction since August and framing is set to be completed next week. Watch the video below and see how quickly the CLT panels and glulam frame are assembled! 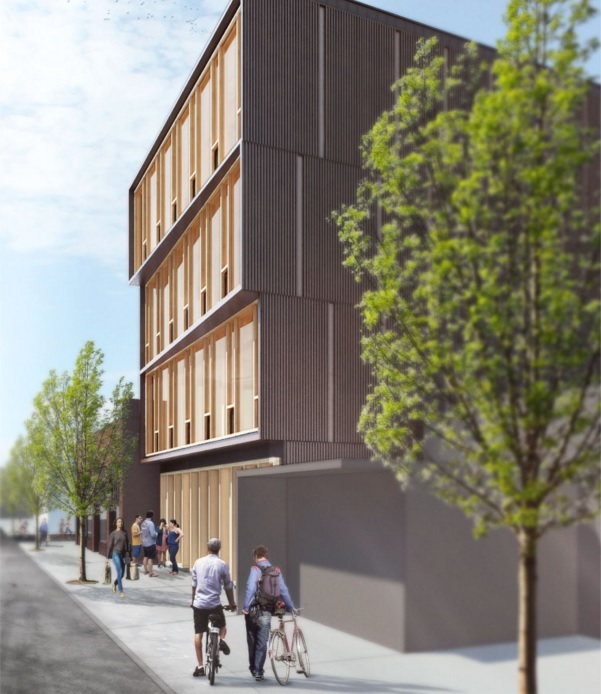 According to the Albina Yard fact sheet, the building will utilize mass timber construction with “glue-laminated timber frame and cross-laminated timber (CLT) panels manufactured and prefabricated at D.R. Johnson Lumber Co. in Riddle, [Oregon].” Albina Yard represents a collaboration between Reworks Inc. (contractor, developer, owner, and builder), LEVER Architecture (designer), and KPFF Consulting Engineers (structural engineer). This is not the first time LEVER Architecture has made the news for their wood building design. In September 2015, they won the U.S. Tall Wood Building competition for the West coast. Update: We incorrectly identified LEVER Architecture as the builder. The builder is Reworks Project and LEVER Architecture is the designer.